Enjoy a respite in the 58-unit townhome neighborhood known as The Palms of Freeport. 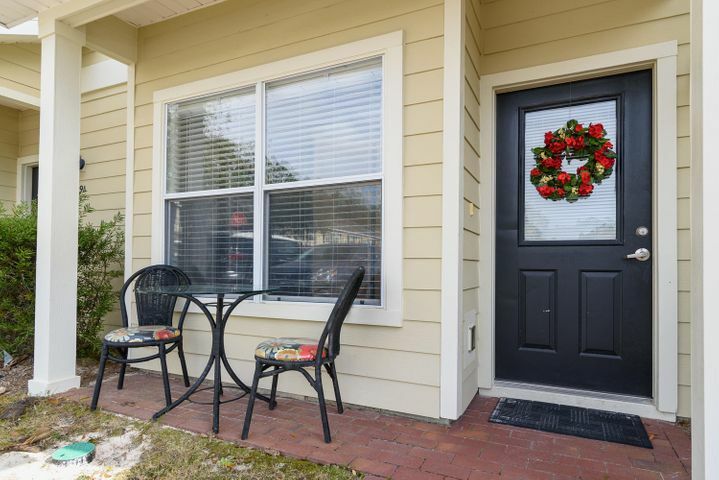 It's not in the middle of the gridlock of South Walton, but still only 15 minutes from the Beach and less than 30 minutes from Seaside, and conveniently located with easy access to Niceville, Destin and Eglin AFB. Just the right size with two bedroom, two and a half bath home, with a Pool, Picnic area and Playground right outside the front door. Both bedrooms are upstairs with a bathroom each and the laundry area in between the rooms. This home has fresh paint, new carpet (downstairs) and a brand new HVAC (October 2018). The community of townhomes sits amidst a Pine Forrest and is landscaped nicely with Palms and grass. This unit provides an open floor plan and the kitchen boasts stainless steel appliances & granite countertops, great storage and wood cabinets and pantry. Spread out your entertainment and BBQ on the back wooden patio off the living room. There is conveniently a half bath downstairs. This is an excellent investment or first home. © 2019 Emerald Coast Association of REALTORS®, Inc. (ECARMLS). The information being provided is for consumers personal, non-commercial use and may not be used for any purpose other than to identify prospective properties consumers may be interested in purchasing. Information is believed to be accurate but is not guaranteed. Data last updated: Wednesday, April 24th, 2019 01:12:09 PM. Listing courtesy of Fathom Realty FL LLC.